A trio of orbiting X-ray telescopes, including Chandra, was used to make this discovery. A trio of X-ray observatories has captured a remarkable event in their data: a decade-long binge by a black hole almost two billion light years away. This discovery was made using data from NASA's Chandra X-ray Observatory, Swift Observatory, and ESA's XMM-Newton, as reported in our press release. This artist's illustration depicts what astronomers call a "tidal disruption event," or TDE. This is when an object, such as a star, wanders too close to a black hole and is destroyed by tidal forces generated from the black hole's intense gravitational forces. During a TDE, some of the stellar debris is flung outward at high speeds, while the rest (shown as the red material in the illustration) becomes hotter as it falls toward the black hole, generating a distinct X-ray flare. A wind blowing away from this infalling material is shown in blue. Among observed TDEs, this event involved either the most massive star to be completely ripped apart and devoured by a black hole or the first instance where a smaller star was completely ripped apart. The resulting X-ray source is known as XJ1500+154 and is located in a small galaxy about 1.8 billion light years from Earth. 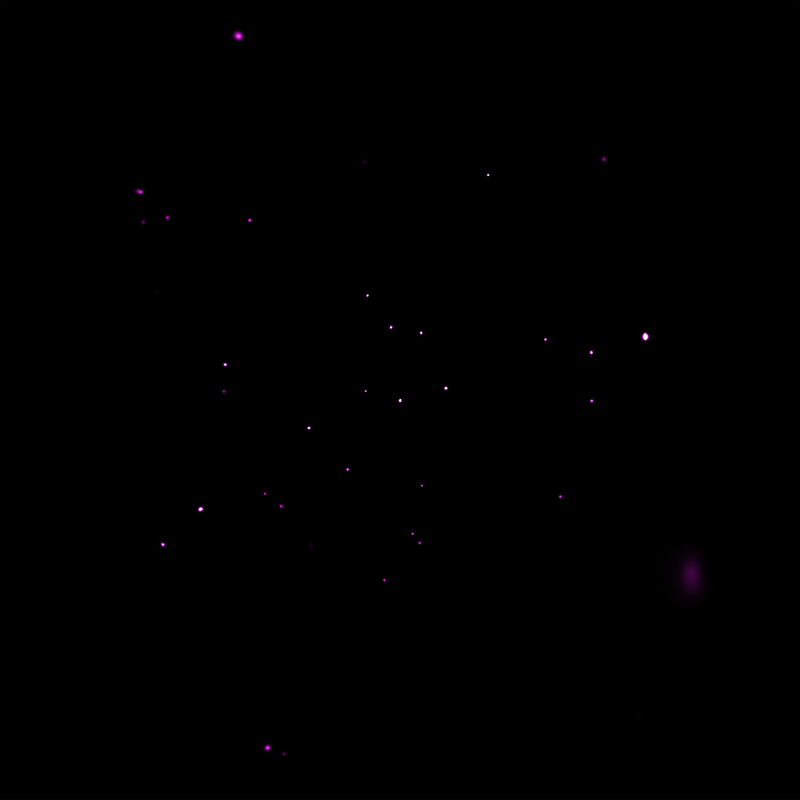 The optical image in the left inset shows this galaxy and a cross to mark the location of XJ1500+0154. This image reveals that XJ1500+0154 is found in the center of the galaxy, implying that the source likely originates from a supermassive black hole that resides there. The image on the right shows XJ1500+0154 in the Chandra image covering the same field. The source was not detected in a Chandra observation on April 2, 2005, but was detected in an XMM-Newton observation on July 23, 2005, and reached peak brightness in a Chandra observation on June 5, 2008. 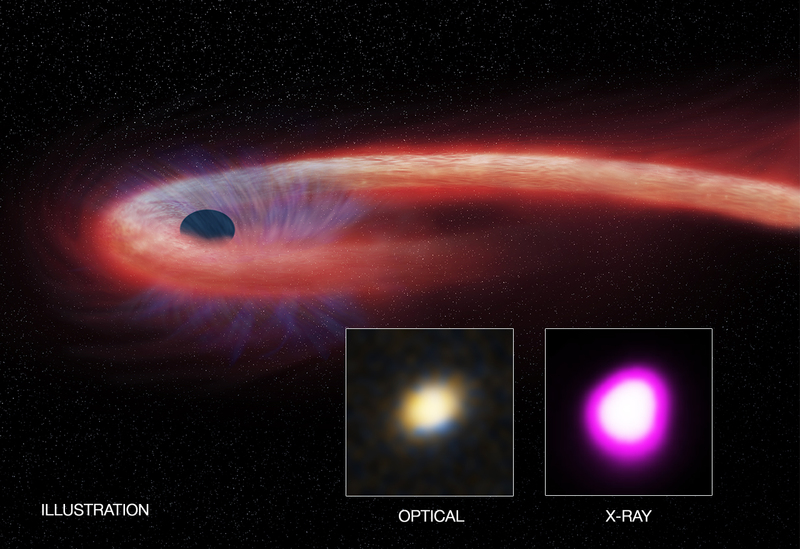 These observations show that the source became at least 100 times brighter in X-rays. Since then, Chandra, Swift, and XMM-Newton have observed it multiple times. This TDE may help answer the question as to how supermassive black holes in the early universe grow. If supermassive black holes can grow, from TDEs or other means, at rates above those corresponding to the Eddington limit, this could explain how supermassive black holes were able to reach masses about a billion times higher than the sun when the universe was only about a billion years old. A paper describing these results appears in the February 6th issue of Nature Astronomy. The authors are Dacheng Lin (University of New Hampshire), James Guillochon (Harvard-Smithsonian Center for Astrophysics), Stefanie Komossa (QianNan Normal University for Nationalities), Enrico Ramirez-Ruiz (University of California, Santa Cruz), Jimmy Irwin (University of Alabama), Peter Maksym (Harvard-Smithsonian), Dirk Grupe (Morehead State University), Olivier Godet (CNRS), Natalie Webb (CNRS), Didier Barret (CNRS), Ashley Zauderer (New York University), Pierre-Alain Duc (CEA-Saclay), Eleazar Carrasco (Gemini Observatory), and Stephen Gwyn (Herzberg Institute of Astrophysics). A supermassive black hole eating a star. About 1.8 billion light years away from Earth. X-rays from Chandra and optical data from CFHT. Inset images are 11 arcsec across. X-rays are pink and optical is red, green, and blue.